10 club members cleaned up the public walkways around the Oasis. The club supported McDonald's LWYL events in the past and decided to organise its own events and Monday was the first of these. MCDONALDS franchisee Ismail Anilmis and his staff from the Bedford High Street branch have joined forces with Keep Britain Tidy, and Rotary Club of Bedford Castle to collect litter in the area. The team consisting of 10 volunteers cleared the public walkways around the Oasis swimming pool, collecting 19 bags of litter in the process, as well as 57 pence in change. The event was part of Keep Britain Tidys campaign, Love Where You Live, of which McDonalds was a founding partner. Now in its fourth year, the campaign seeks to encourage communities to take responsibility for keeping their neighbourhood litter-free, and to take pride in the local environment . 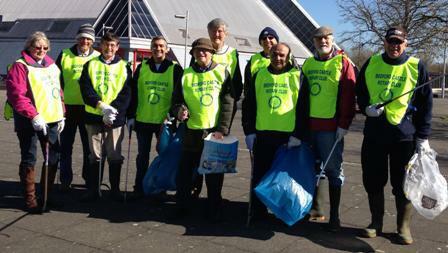 Franchisee Ismail Anilmis said: It was great for us to get together to take action against litter, and Id really like to thank my staff and Rotary Club of Bedford Castle for their support. Litter is everyones responsibility, and this event will hopefully raise awareness of the issue, and educate people to dispose of their rubbish responsibly.